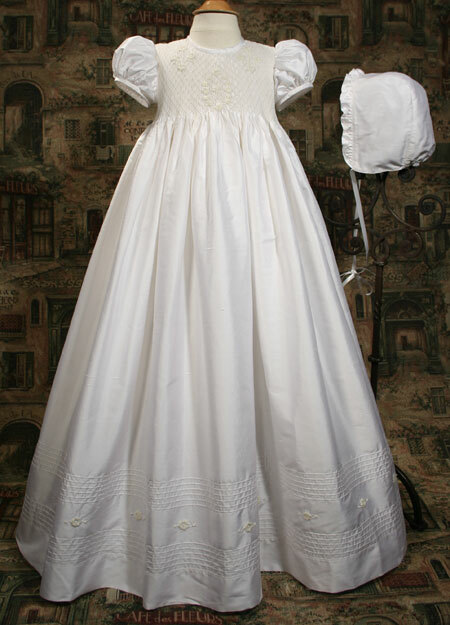 Beautifully smocked silk dupioni (slightly off white) 32” gown with hand embroidery and pin tucking on bodice and skirt. Sash at back of gown and stretch in smocking enables gown to fit several size babies. Embroidered and pintucked hemline. Includes matching bonnet and attached slip. 100% Silk Dupioni. Dry clean. Hand made in South America. Shipped with elegant padded hanger and zippered vinyl bag. Heirloom Preservation Bag recommended for long term storage.